Afro-Heritage Broadcasting and Entertainment Awards (AHBEAWARDS) is set to unveil African entertainers who will be recipients for the 2018, 4th edition in few weeks time. AHBEAWARDS is ranked the best awards event for Africans across the globe in entertainment, broadcasting, sports and entrepreneurial leadership. The city of Houston, Texas, USA will for the 4th time play host to Africans from across major Africa countries as AHBEAWARDS organizers appreciates, celebrates and honour these African world stars. 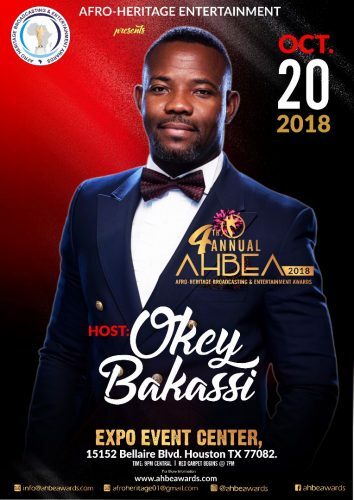 Date of the event is 20th October 2018, venue, Expo event centre 15152, Bellaire boulevard, Houston TX 77082, time, 9pm while red carpet begins at 7pm, visit www.ahbeawards.com for more details.